Are you trying to get your kids to eat more vegetables? Don’t overlook beans! Beans are high in protein and fiber. They are also low in calories and fat, plus they are cholesterol free. 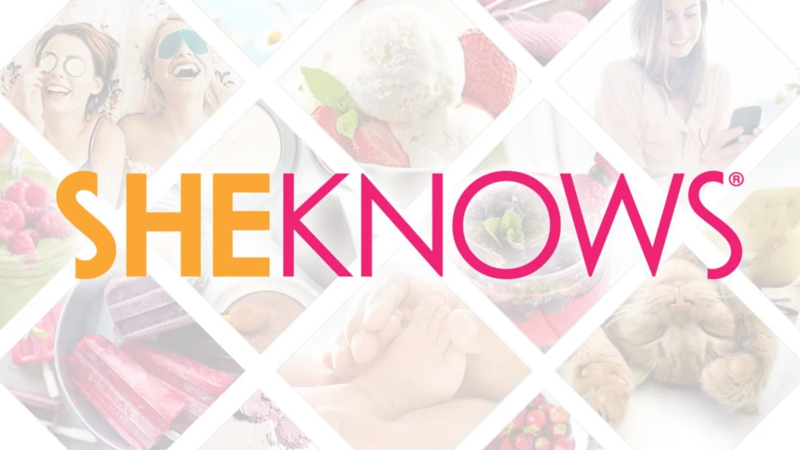 These summer recipes are kid-tested and feature nutrient-rich beans as a primary ingredient. 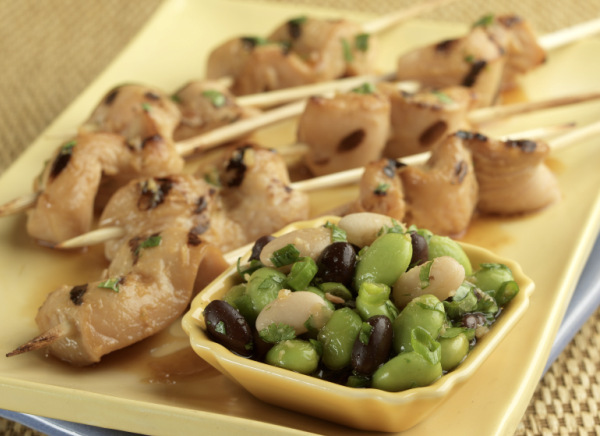 This recipe for Asian Satay Skewers with Black Bean Sauce was created for BUSH’S Beans by Connie Guttersen, R.D., Ph.D., nutrition instructor at The Culinary Institute of America, mom and author of “The Sonoma Diet.” This kid-friendly recipe was tested by families on BUSH’S Beans Moms and Kids Panel. 1. For the Satays: Season chicken with salt and pepper. Combine teriyaki sauce, ginger, garlic, and sesame oil in a medium bowl. 2. Toss the marinade with the chicken. Let marinate for 45 minutes minimum. Weave meat onto skewers. Discard marinade. 3. Cooking: Preheat the grill to medium hot. Take a 12-inch sheet of heavy duty foil, fold in thirds lengthwise. Place on the grill by the edge. 4. Place satays on the grill laying meat end over fire, and the wood end on the piece of foil. This will help keep the exposed wood from burning. 5. For the Sauce: Combine beans, soybeans, green onions, ginger and cilantro into a medium bowl. Mix well. 6. In a small bowl, combine sugar, lime juice, and soy sauce. 7. Mix until the sugar dissolves. Add garlic, chile, and sesame oil. Let sit for 5 minutes. 8. Add soy sauce mixture to the beans, gently toss to coat. 9. Serve the satays with bean salad. Drizzle some of the liquid from the salad on top of the satays. Note: You can substitute skirt steak or flank steak for the chicken. Cut the meat against the grain into 1/4-inch thick by 2-inch long pieces. 1. In a large pot, boil water and make pasta according to box directions. 2. 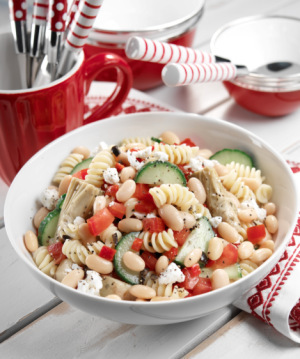 In a large bowl, combine tomatoes, garlic, cucumbers, red peppers, artichokes, olives, and pasta. 3. Add beans and gently mix. 5. Sprinkle with feta cheese. Dr. Connie Guttersen, R.D., Ph.D., is the author of the New York Times bestseller “The Sonoma Diet” and “The Sonoma Diet Cookbook.” Her revolutionary program has garnered coast-to-coast media attention, and she has discussed the Sonoma philosophy to considerable acclaim in dozens of television venues, including “The View,” “The Early Show,” CNN and FOX News, just to name a few. For more kid-friendly vegetable recipes from Connie and additional information on the benefits of beans, visit VegetableWithMore.com.